The Eastern elevation that faces the visitor has a reduced scale with the roof lights forming a recognisable profile. 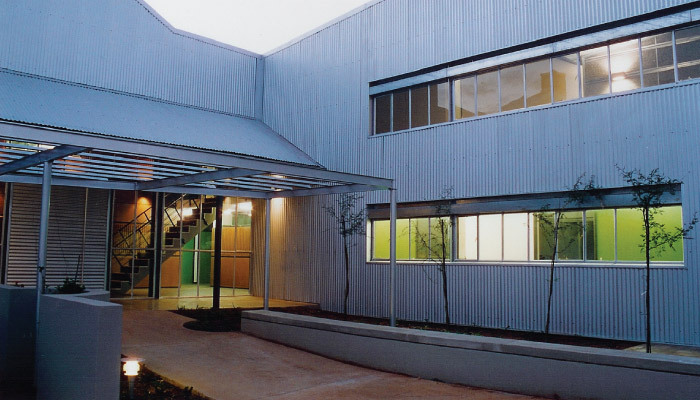 This office and warehouse building was designed for Indigenous Systems, manufacturers and suppliers of specialised medical equipment. 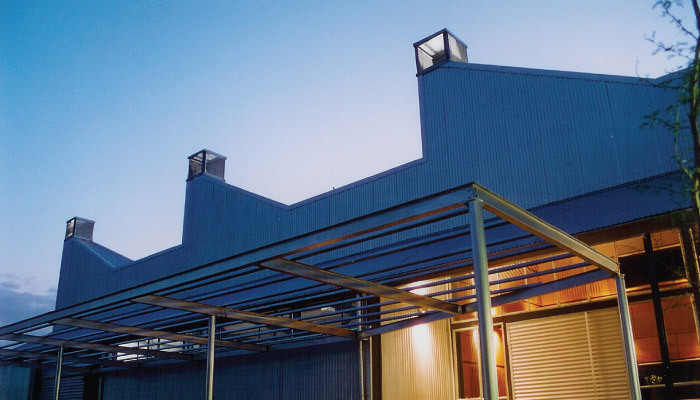 The brief called for a building that would not only house the manufacturing and storage requirements of the company but would also serve as a venue for promoting its products. 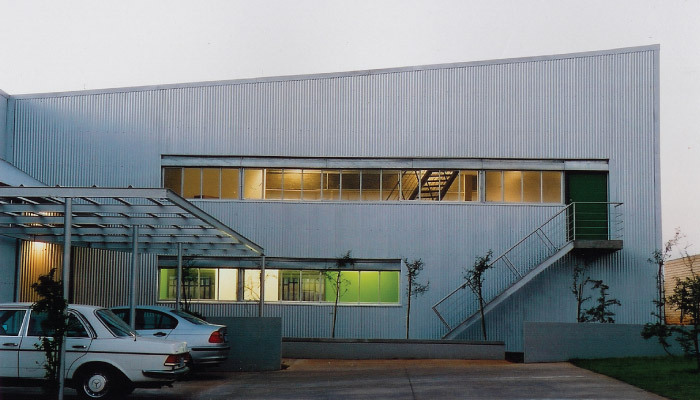 The site is located in a large light industrial office park in Midrand. The office park is next to the N1 Highway and the site for this building is right next to a road reserve for a future road that would cross the N1 highway. 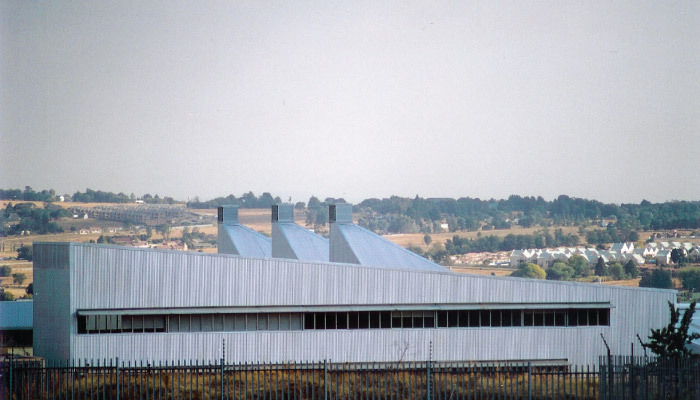 The northern facade of this building would face this future road and is visible from the N1. 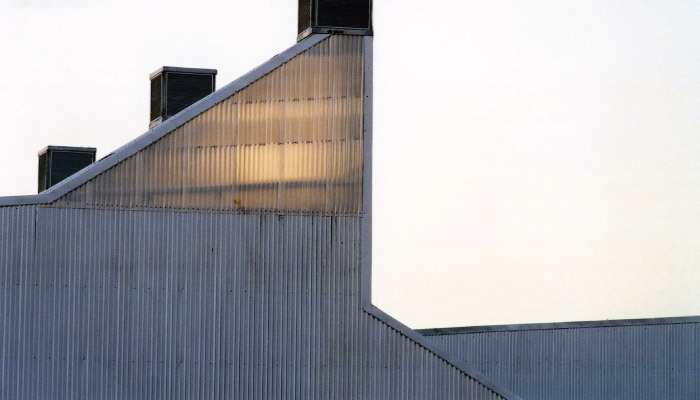 For this purpose the northern facade has a bold and simply articulated facade with a “giant order” forming an iconic image of the building for passing motorists. In contrast, the building is approached from a dead -end road inside the office park. The Eastern elevation that faces the visitor has a reduced scale with the roof lights forming a recognisable profile. The architecture has grown out of two attitudes. The first is a sculptural “solid form” with simply articulated openings and strong profiles. 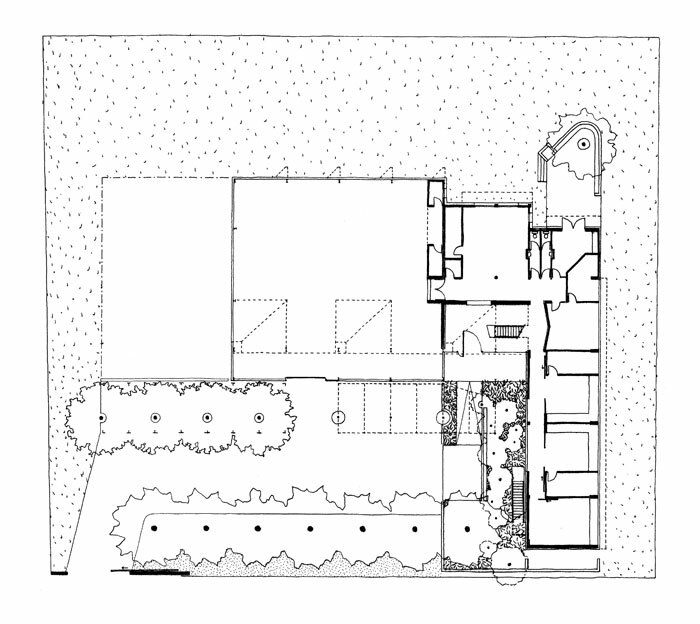 The second idea is that the forms of the architecture should be mediated by a primary layer of landscaping. 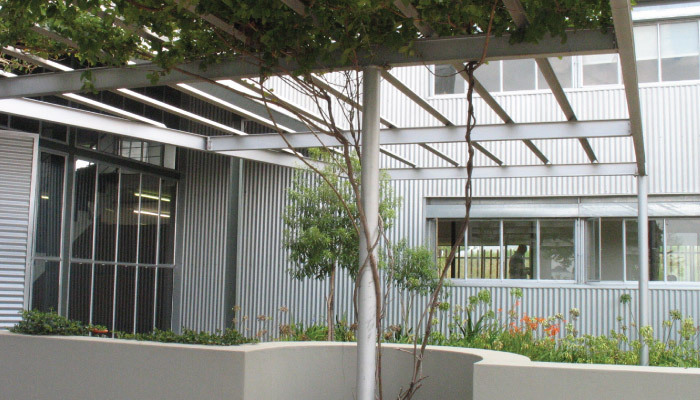 The landscaping mediates the power of the sculptural forms. The sculptural forms seem to rotate in space as cars move past it, but remain a backdrop to the landscape layer when experienced on foot. The beauty of the indigenous Highveld grasslands has almost entirely been replaced by spatially incongruent architectures that reflect the divergent cultural aspirations of the people of Gauteng. In the context of such diversity and where the oldest buildings are 15 years old, the landscape layer is the only reasonable unifying device available. The primary architectural layer – the planted landscaped of the forecourt – connects new and old, and neighbour to neighbour. The landscaped forecourt consists of two lines of trees providing shaded parking. One half of the parking is on a hard surface, the other is a grassed parking area. A shade structure with colourful creeper extends from the parking area over the entrance court. The entrance court is planted with low shrubs and Acacia trees. The entrance itself is designed as a stoep. The indigenous grass was restored on site after construction to reconnect the site with its original landscape. 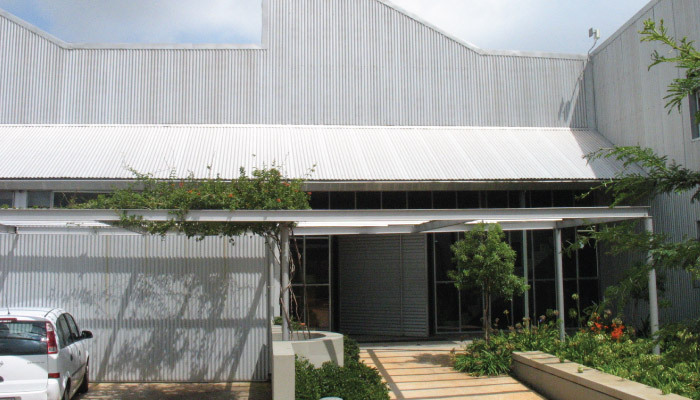 The corrugated sheet cladding unifies the walls and roofs into a single form. The interior of the office section has an additional brick skin on the inside to insulate against sound and temperature. 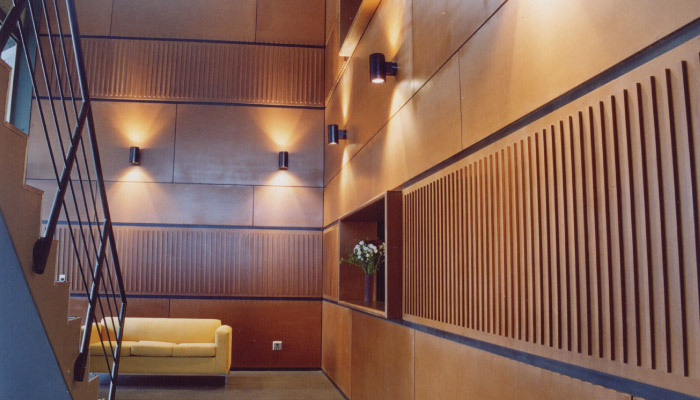 The entrance foyer is clad in Supawood. The building is naturally ventilated. The roof lights/ventilators ventilate the warehouse and the foyer by allowing the rising hot air to escape at the highest point. The office section can be cross-ventilated because of its narrow width. The rooflights are lit at night to describe the roof form.